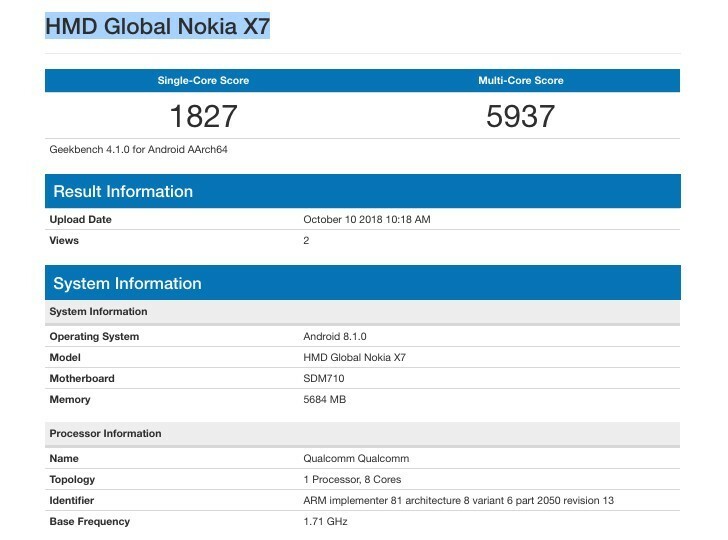 HMD Global is expected to make the Nokia 7.1 Plus official at an event tomorrow. Today someone in possession of a unit has decided to put it through the paces of Geekbench. As usual in such cases, this tells us a few things about the upcoming handset. First off, it's powered by the Qualcomm Snapdragon 710 chipset, as rumored countless times before. This particular unit pairs that with 6GB of RAM, but there may be other versions with 4GB. The phone runs Android 8.1 Oreo, perhaps disappointingly, considering that Pie has been out for a while now and HMD itself is already in the process of updating its older devices to the latest iteration of Google's OS. That's everything outed today, but according to past leaks and rumors the Nokia 7.1 Plus will come with a 6.1-inch 1080x2246 display with a notch, 64 or 128GB of storage, a 12 MP + 13 MP Zeiss branded dual rear camera setup, a 20 MP selfie shooter, and a 3,400 mAh battery.